Lina Wertmüller (Italian: [ˈliːna vertˈmyller; -mul-]; born 14 August 1928) is an Italian screenwriter and film director. She was the first woman nominated for an Academy Award for Best Director for Seven Beauties in 1977. She is also known for her films The Seduction of Mimi, Love and Anarchy and Swept Away. Wertmüller was born Arcangela Felice Assunta Wertmüller von Elgg Spañol von Braueich in Rome in 1928 to a devoutly Catholic Swiss family of aristocratic descent. Wertmüller has depicted her childhood as a period of adventure, during which she was expelled from 15 different Catholic high schools. During this time she was infatuated with comic books, describing them as especially influential on her in her youth, particularly Alex Raymond’s Flash Gordon. Wertmüller characterizes the framing of Raymond’s comics as “rather cinematic, more cinematic than most films”, an early indication of a natural inclination towards the cinematic. 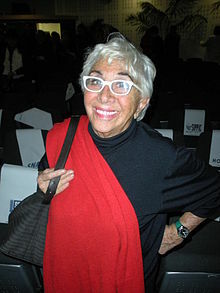 Wertmüller has spoken about her desire to work in the film and theater industries as taking hold of her at a young age, as early on in life she developed an appreciation for the works of famed Russian playwrights Pietro Sharoff, Vladimir Nemirovich-Danchenko, and Konstantin Stanislavsky, a sentiment that drew her into the world of performing arts. After graduating from Accademia Nazionale di Arte Drammatica Silvio D'Amico in 1951, Wertmüller produced a number of avant-garde plays, traveling throughout Europe and working as a puppeteer, stage manager, set designer, publicist and radio/TV scriptwriter. These interest from her youth continued to develop as time wore on, and her creative attention beginning to gravitate towards two generic avenues; one being the musical comedy and the other being grave, contemporary Italian dramas like the works of Italian playwright and director Giorgio De Lullo, whose work she describes as “serious” and “politically conscious”. It is these two approaches that Wertmüller says are at the core of her creative self, and always will be. After her years spent touring with an avant-garde puppet group, Wertmüller set her sights on film. In the early 1960s, Flora Carabella, a school friend, introduced Lina to Marcello Mastroianni, Flora’s husband and famed Italian actor, who introduced her to mentor and renowned auteur Federico Fellini. Wertmüller has spoken a great deal on the importance of her relationship with Fellini, with particular emphasis on his influence on her during her time as assistant director on 8½. Describing their collaboration and his character in an interview, Wertmüller is quoted as saying: “You can not speak about Fellini. Describing him is like describing a sunrise or sunset. Fellini was an extraordinary human being, a force of nature, he was a man of extraordinary intelligence and sympathy. In the documentary I talked about many moments with him while we were filming 8½. Meeting Fellini is like discovering a wonderful unknown panorama. He opened my mind when he said something that I will never forget: “If you are not a good storyteller, all the techniques in the world will never save you.” He told me that before I started shooting my first film, 'I basilischi'". Although The Basilisks, which was scored by Ennio Morricone, was critically well received, it did not garner the sort of attention that her later works would. Throughout the 1960s, Wertmüller produced a series of films that were well liked but that failed to garner international success. Of these films, her first collaboration with Giancarlo Giannini occurred in 1966’s musical comedy Rita the Mosquito. As Darragh O’Donoghue described in an issue of Cineaste, generally “her early films comprise a fairly straight pastiche of neorealism and early Fellini (The Lizards, 1963, available without English subtitles on YouTube), an episodic comedy, two musicals, and a lovely Spaghetti Western (The Belle Starr Story, 1968, directed under the pseudonym Nathan Wich, and available in a bleached English dub on YouTube)-works where knowledge of generic predecessors was essential”. The 1970s for the socialist auteur saw the release of virtually all of her most influential and highly regarded films, many of which featured a collaboration with Giancarlo Giannini. Beginning in 1972 with The Seduction of Mimi, and continuing until 1978 with Blood Feud, Wertmüller released seven films many of which are considered masterpieces of Commedia all'italiana. It was during this time she saw critical and international success, gaining traction as a filmmaker outside of Italy and in the United States on a scale that many of her contemporaries were baffled by and unable to attain themselves. In 1975, Swept Away won Top Foreign Film awarded by the National Board of Review in the United States and the following year, this period of highly celebrated creative output culminated in the 1976 film, Seven Beauties, for which she became the first female director to be nominated for an Oscar. This film, which again features Giannini in the lead role, pushes Wertmüller’s specific brand of tragic comedy to its limits, following a self-obsessed Casanova from a small Italian town who is sent to a German concentration camp. The film was initially met with controversy due to Wertmüller’s frankness in her rendering of the apparatuses of genocide as well as her perceived macabre insensitivity towards its survivors, but since has been widely celebrated and accepted as her masterwork. She signed a contract with Warner Bros. to make four films and her first for them was her first English language film, titled A Night Full of Rain, wentered into the 28th Berlin International Film Festival in 1978. The film was not a success and Warners cancelled the contract. Her 1983 film A Joke of Destiny was entered into the 14th Moscow International Film Festival in 1985 and Camorra (A Story of Streets, Women and Crime) was entered into the 36th Berlin International Film Festival in 1986. In 1985, she received the Women in Film Crystal Award for outstanding women who, through endurance and the excellence of their work, have helped to expand the role of women within the entertainment industry. After this period of acclaim, Wertmüller began to fade out of international prominence, although she continued to expediently release films well into the 1980s and 90s. Some of these films were sponsored by American financiers and studios, yet they failed to have the breadth of reach that her 70’s output achieved. While these films are less widely seen and were neglected or disparaged by most, films like Summer Night (1986), Ferdinando & Carolina (1999), Ciao, Professore are retroactively thought of as worthwhile. She is known for her whimsically prolix movie titles. For instance, the full title of Swept Away is Swept away by an unusual destiny in the blue sea of August. These titles were invariably shortened for international release. She is entered in the Guinness Book of Records for the longest film title: Un fatto di sangue nel comune di Siculiana fra due uomini per causa di una vedova. Si sospettano moventi politici. Amore-Morte-Shimmy. Lugano belle. Tarantelle. Tarallucci e vino. That 1979 movie with 179 characters is better known under the international titles Blood Feud or Revenge. Wertmüller was married to Enrico Job (died 4 March 2008), an art designer who worked on several of her pictures. In 2015, Wertmüller was the subject of a biographical film directed by Valerio Ruiz titled Behind the White Glasses, in which she reflects on her life’s work. Wertmüller continues to work as a director in the theater. The influence of Fellini’s style is evident in much of Wertmüller’s work. The two share a common empathy with the way their films view of the Italian working class, showing the realities of life for the politically neglected and economically downtrodden with a tendency towards the preposterous. Wertmüller’s work also seems to exhibit a true adoration of Italy and its varied locales, beautifying elements of her film’s locations with cinematography that presents the camera’s subjects with a colorful extravagance that idealizes the distinctly Italian settings of her films. Her aesthetic is one that borrows heavily from her background in theater, routinely using the camera in such a way that emphasizes performance and the grandiose comedy of her characters’ near constant state of emotional frenzy. Much of her work uses formal film tactics to dramatize the misapplication and destructive qualities that political ideology can have on individuals, satirizing common conceptions of revolution and the political status quo in the process. Narrative and cinematic reflexivity are also commonplace in Wertmüller’s films, as she rehashes and refigures signs and recognizable modes of presentation in a way that references her inspirations and the films of her contemporaries. This is made clear through her disruption of traditional conceptions of virtually all political dogma and the irrationality of her masculine, and occasionally feminine, figures, taking recognizable elements of society and film and critiquing them through doing away with any sort of narrative and character plausibility. This is particularly evident in a film like her 1972 film The Seduction of Mimi. This film positions Mimi (played by Giancarlo Giannini) as an impossibly inept and simple man who fully embodies the notion of Italian machismo, as he fumbles his way through a world that throws a variety of ideologies and economic positions at him, all of which he readily inhabits. Mimi is perpetually successful in his performance of these roles, despite the audiences’ awareness of their inauthenticity that results from a diegetic acknowledgement of Mimi’s hapless ignorance. This element of critique in the film functions as one example of many of most prevalent themes in Wertmüller’s work, as the underlying meaning for much of her work is a desire to deconstruct and subvert the institutions and social ideologies of a capitalist modernity. This socialist-inflected politicization of ideas of class and the institution are extended to sexuality and gender as well. Most of her films deploy these elements in conjunction with her affection for the theatrical in such a way that creates a unique concoction that is undeniably within the generic confines of Commedia all’italiana. Laraine Newman impersonated Wertmüller twice on Saturday Night Live. In general, Wertmüller's films highly reflect her own political commitments, with main characters who are either dedicated anarchists, communists, feminists, or all those—and main action that centers on political or socioeconomic conflicts. Wertmüller self-identified as socialist. 1985, Women in Film Crystal Awards. Winner for achievement. 1986, Berlin International Film Festival, Otto Dibelius Film Award for Camorra (A Story of Streets, Women and Crime). 2008, Flaiano International Prizes. Winner of career award. 2009, Golden Globes Italy. Winner of Golden Globe for career achievement. 2010, David di Donatello Awards. Winner for career achievement. 2017, Boston Society of Film Critics Awards. Best Rediscoveries for Seven Beauties. O'Donoghue, Darragh. "Laughter in the Dark: The Black Comedy of Lina Wertmüller." Cineaste, Fall 2018, 15-21,78. Jacobs, Diane and Brooks Riley. "Lina Wertmuller." Film Comment v. 12, no. 2 (Mar, 1976): pp. 48-51, 64. Foster, Gwendolyn. Women Film Directors: An International Bio-critical Dictionary, p. 371, Greenwood Publishing Group, 1995. Behind The White Glasses, Dir. Valerio Ruiz, Italy, 2015. A few sources (, ) continue to cite 1926. ^ Giorgio Dell'Arti, Massimo Parrini, Catalogo dei viventi 2009 - voce Wertmüller Lina, Venezia, Marsilio Editori, 2008; ISBN 978-88-317-9599-9. ^ a b c Behind The White Glasses, Dir. Valerio Ruiz, Italy. 2015. ^ Foster, Gwendolyn Audrey. Women Film Directors: an International Bio-Critical Dictionary. Greenwood Press, 1995. ^ "IMDB.com: Awards for A Night Full of Rain". imdb.com. Retrieved 7 August 2010. ^ a b Chu, Henry (February 2018). "Lina Wertmüller on What Being the First Female Director Nominated for an Oscar Means to Her". Variety. Retrieved March 17, 2019. ^ "14th Moscow International Film Festival (1985)". MIFF. Archived from the original on 16 March 2013. Retrieved 17 February 2013. ^ "Berlinale: 1986 Programme". berlinale.de. Retrieved 14 August 2015. ^ bea_xx. "Past Recipients". Archived from the original on 30 June 2011. Retrieved 26 October 2014. ^ a b Jacobs, Diane and Brooks Riley. "Lina Wertmüller." Film Comment 12, no. 2 (Mar, 1976): 48-51,64. ^ a b c O'Donoghue, Darragh. "Laughter in the Dark: The Black Comedy of Lina Wertmüller." Cineaste, Fall, 2018, 15-21,78. ^ Bullaro, Grace. Man in Disorder: the Cinema Of Lina Wertmüller in the 1970s Troubador Publishing. 2007.